Part of February's to-do list is to convert the study into a therapy room. Unfortunately the study has been used as a dumping ground in recent times, so we are looking at a major job! 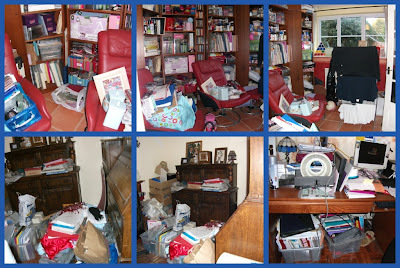 The desk needs to be moved into the den - which in itself needs a clean out - and every drawer and box needs going through! Not an overnight job. Then fill in holes, repaint walls and fireplace and decorate. All by the weekend? No sweat! Also have some crafting and furniture updating desperately need doing. Have I ever mentioned there's really not enough hours in the day?! Also, Ella's social worker has visited, been to Anna's for a coffee and Ella coped really well at Kids Club. Today may be SAT result day from Josh, everything crossed. And usual stuff with kids and life. Funny tale about my adorable God-Daughter ......... reciting the alphabet with Orla in the bath (as you do)...O: "A..B..C.....M...N... O, that's me Mummy, P..." Me:"Q...what comes after Q?" O: "arse" Me: "pardon?" O: "arse...T"...:0) I think maybe they've been saying it a bit quick at school! LMAO!